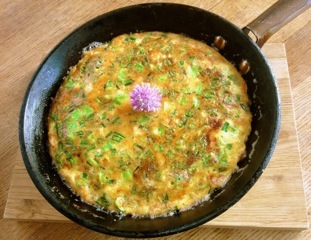 Genuine Jersey member Elke Jacques from Flavour.je sent us this recipe for an omelette using delicious local produce, along with her favourite sources for ingredients. Boil the royals with a sprig fresh mint and salt. Hand whisk the eggs with a tea spoon of paprika, a teaspoon of white pepper and two teaspoons of English mustard until glossy and smooth. Chop the onions, chives, capers. Slice or cube cooked royals. Grate half a block of cheddar add everything together and fold until evenly mixed together. Turn on grill medium to high then heat a tbs spoon of olive oil and butter in a non stick frying pan, approx 6 to 8 inches wide. Add all of the mixture and stir into butter and oil. Once the omelette is 3/4 cooked, top with more grated cheese if, like me, you love cheese! Place under grill until golden brown. Serve alone or with salad. For the meat lover this also works extremely well with Classic Herd bacon or sausage. And for the indulgent, a chunk of cabbage loaf with Classic Herd butter. Thanks, Elke, it sounds great!